The next time you’re throwing away trash from Papi’s Store on State Street, you might get an unexpected welcome from the surrounding community — and a standing invitation to help make it cleaner. 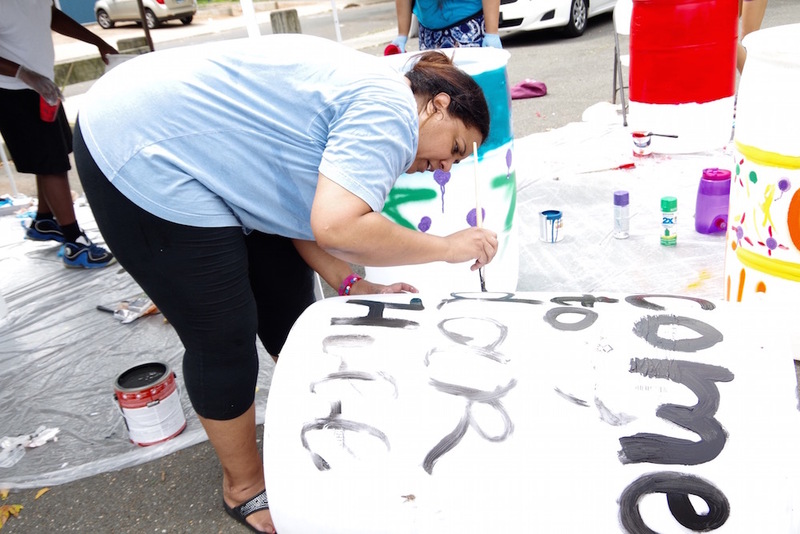 That’s the idea behind five new, hand-painted trash barrels lining State and May Streets and Rice Field in Cedar Hill, an eight-block neighborhood cut off from the rest of New Haven by I-91. 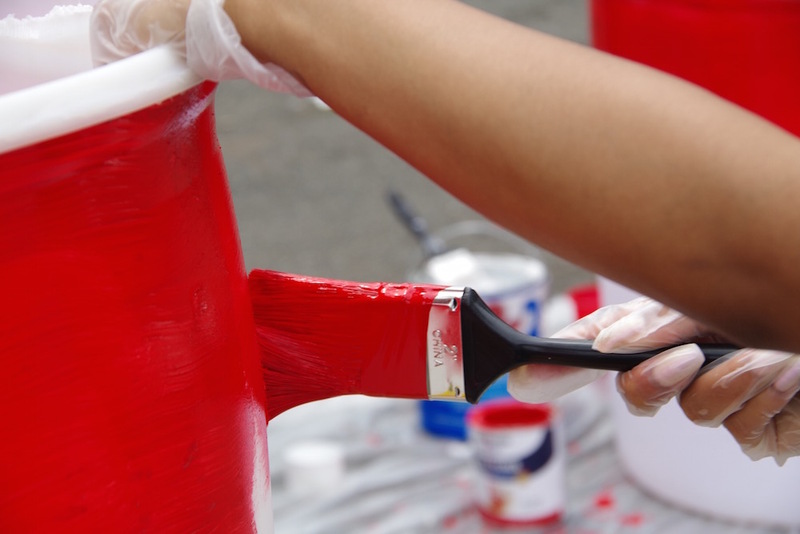 Friday afternoon, neighborhood activist Camille Ansley held a “Cedar Hill Paint Party” to decorate the barrels and a soon-to-be little free library in a parking lot on State Street. That location has special significance to her as an organizer, resident, and area mom: since 2011, the lot has boasted a sign welcoming drivers and pedestrians to the neighborhood. Without it, “you wouldn’t know that this was Cedar Hill,” she said. Now, the sign isn’t the alone in spreading the word. Provided by the Department of Parks, Recreation and Trees, the barrels are stand-ins to replace planters that were stolen from Rock Street earlier this summer. Parks Director Rebecca Bombero got them to Ansley this month, through a partnership the department offers to communities. But the barrels also have a welcoming mission, Ansley said Friday. With a new little free library and unfolding underpass mural project, they join beautification efforts funded by New Haven’s Livable City Initiative (LCI). 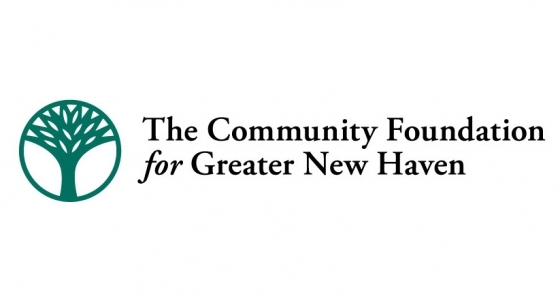 That includes $10,000 from its Neighborhood Public Improvement Program (NPIP), on which the East Rock Community Management Team voted unanimously in May. 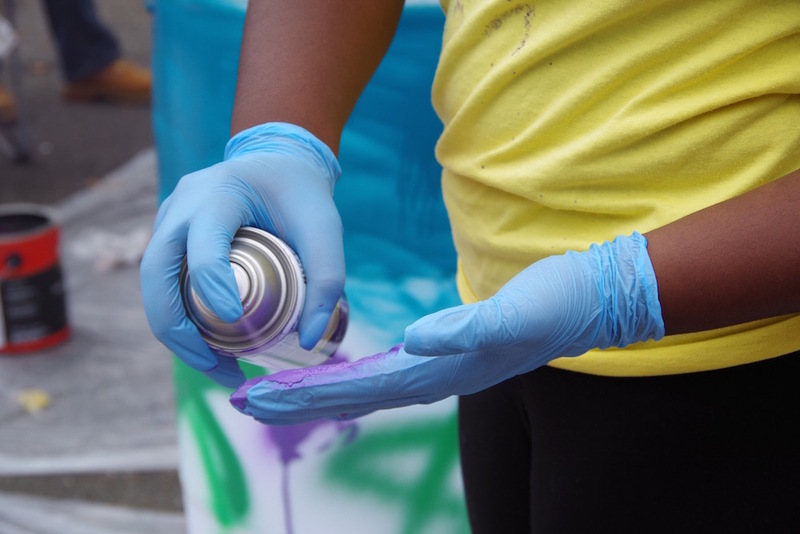 For Ansley, who has spent the past months on a crusade to clean up graffiti and re-light the streets, the barrels are another vehicle for community building. As she watched Keysha Figueroa step out onto her porch Friday afternoon, she called out a single question: why didn’t Figueroa come down and help for a little while? A Cedar Hill transplant, Figueroa looked from her second-floor porch onto the lot, where Ansley was setting out squat cans of paint, aerosol spray, paintbrushes, and latex gloves on a tarp. Ansley grinned and gestured to the barrels. Figueroa headed down the stairs, bounded over to the lot, and grabbed a brush. Two minutes later, she was coating a barrel with red paint and chatting about her upcoming 22nd birthday with Ansley. She was just the first who learned about the session through Ansley. Watching Curron Martin and his wife Miranda Simmons walk by the lot, Ansley waved, pointed to the unfinished work around her, then made her pitch. “Are you going to come paint?“ she started. Then she paused. “Oooh! Is that a baby bump? !” she asked. “It’s been so long since I’ve seen you!” As they walked into the lot, Ansley embraced both of them — then put them to work. Martin went straight for a can of black spray paint, planning out how many times the letters C.H. could wrap around the base of the barrel. A third generation Cedar Hill activist — his mom is Kennya Adams-Martin, and his grandmother is Betty Thompson — Martin joked that he and Simmons hadn’t volunteered to paint, so much as they were “voluntold” for it. Adams-Martin and Thompson wouldn’t have it any other way, he said. As if on cue, the two arrived, Thompson nodding at the progress beneath a wide-brimmed sunhat. Thompson checked in on Simmons’ progress, which had expanded to green and orange bursts of color on the barrels wide middle, and glistening bands of red at the top. Ansley waved over contractor Nelson Vizcaino, who is opening a fried chicken business on State Street, to show off a recouped New Haven Register box that is becoming a little free library. Already, she told Vizcaino, her porch is covered with boxes of kids and young adult novels. As Vizcaino offered to stay and paint some seagulls and clouds, Ansley turned back to her Welcome To Cedar Hill barrel.